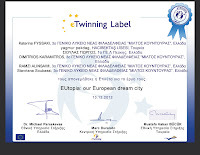 The project is proposed as an example of how school cooperation may foster European active citizenship in the framework of the European Year of Active Citizenship 2013. The students are encouraged to envisage and design their shared European utopia, the participating by studying several models of utopian societies from different domains (Philosophy, Literature, Art etc) such as Plato’s Politeia, Tomas Moore’s Utopia and Tomasso Campanella’s City of the Sun among many others. Besides, it is recommended that students are acquainted with the well-known dystopias (negative visions of future cities) of Aldus Huxley, ‘Brave New World’ and George Orwell’s ‘1984’. The general aim of this project is to prepare pupils to become responsible European citizens who understand the value and the need of democratic principles in a multi-cultural society. In addition, the project aims at the collaboration of students in designing and presenting a utopian European society which best serves their needs as European citizens. Furthermore, it is of utmost importance to cultivate the students’ critical thinking by evaluating their existing cities in terms of concrete criteria. Moreover, the project offers an opportunity to foster the students’ creativity by reflecting on a utopian vision of the future society. Last, it is intended to provide for intercurricular connections among the school subjects and other areas of learning, such as Ethics and Politics. Having reflected on the proposed utopias and taking into consideration the main aspects of social structure (governance, justice, labour and employment, transport, economics, education and science, health, integration and equality, cross-cultural contact and environment), the students are going to arrive at a shared vision of a model future European society, construct a concrete design exploiting a wide range of ICT tools (TwinSpace Forum, Document Library, Photo Gallery, Web Content, Wiki, Blog and Diaries ). As a follow-up to the project, several activities could take place, such as a musical, a play, paintings and dances in order to represent our utopias. The final products can include: each student’s profile, their first drawings of a dream city, a poster that reflects their decisions at the stage of designing, a 3D model of their Utopian City – characterized as TwinCity as well as videos. Pedagogically speaking, it is expected that the participating students develop learning skills such as research skills, critical information processing skills, multiple ICT skills, cooperation skills as well as taking initiatives, making decisions and solving problems.